I should have stopped with this type of story after Forbidden by Tabitha Suzuma. It's unfair to believe that another book could come close to, or top, that one. 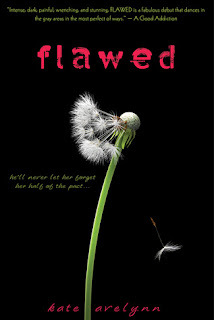 Perhaps if I hadn't read Forbidden previously, I might have enjoyed Flawed more than I did. I think the biggest problem that I had with this book is my total disconnect to the characters. I find it really hard to enjoy a book unless I can relate to the characters or become emotionally invested in them. I wasn't able to do either in this case. I've never experienced any of the situations that Sarah did. And, I am sad to say, I never became invested in any of the characters or what was happening in their lives. Nothing in the story, not even the abuse, gripped me. I wasn't even phased by the ending of the story. Which, by the way, I was hoping would redeem the story for me since I was pretty bored throughout the majority of the book. I even went so far as to read the alternate ending in hopes that I could rate the book higher. No go. Though this book wasn't for me (and I don't see myself recommending it to anyone specifically), Flawed has many good reviews. Read some of them, too, and then decide if this book belongs on your to-read shelf.